Bayonetta publisher Sega kicked off their April Fool’s Day with the announcement of Bayonetta for PC, though not the version fans would expect. “8-Bit Bayonetta” found its way to the Steam marketplace that day as a free 2D shooter starring the titular Umbran Witch. Truly skilled players discovered a link in the description for one of 8-Bit Bayonetta‘s latter Steam Achievements, leading players to a countdown timer featuring Bayonetta’s gun-adorned heel as the background image. Roughly 8 years after its original 360 and PS3 release, the original Bayonetta finally came to PC this morning, confirmed by a surprise Steam listing and a new launch trailer. The Steam version has been updated to include Steam Workshop features, keyboard-and-mouse support, and run at 60fps during gameplay sequences, though cutscenes are still locked to 30fps; for those with capable gaming PCs, Bayonetta will support resolutions up to 4K. 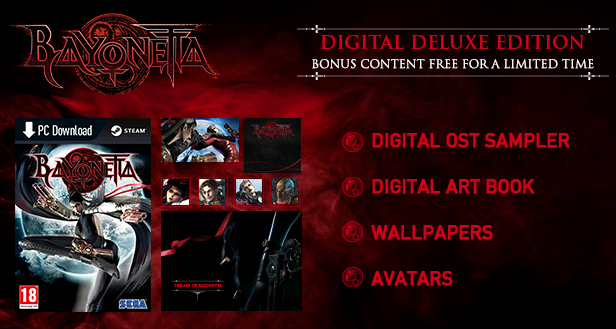 Those who purchase the title before April 25 will receive the “Digital Deluxe Edition” as a bonus, including soundtrack selections, digital art collection, Steam avatars/icons, and a collection of HD wallpapers. Bayonetta can be purchased exclusively for PC via Steam for $19.99.